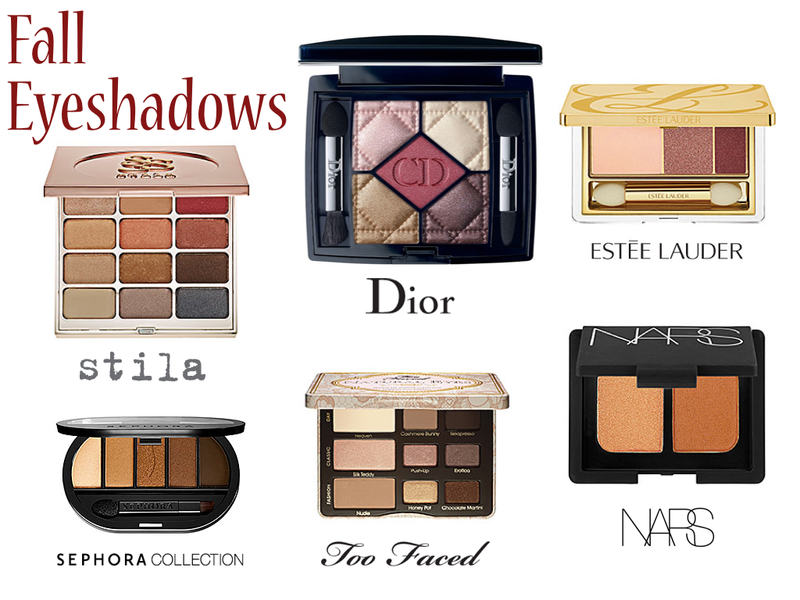 Like most things, I like to switch up my eyeshadows when Summer turns to Fall so I’ve picked out my six favorite palettes, duos & trios for Fall 2014. They’re full of Fall colors like copper tones, bronzes, deep burgundy, taupes and burnt oranges. Stila Eyes Are the Window Shadow Palette in Spirit. These palettes were inspired by the spiritual notion that true beauty is revealed from within. Each of the four palettes represents a different aspect of inner beauty. Most of my favorite hues in the Stila palettes were in the Spirit palette. The copper and taupe tones remind me of a beautiful Fall day full of falling leaves and cold weather. The beautiful shimmers and bright pigmented shades make this a perfect shadow palette for Fall. Dior 5-Color Eyeshadow in Trafalgar. I have always loved Dior eyeshadows, however expensive they may be. I saw this palette and I just couldn’t get over how pretty the burgundy center shade was and how well the ballet pink shimmer and cream shimmer blended together. A great shadow palette for any Fall makeup collection. It will definitely be on my wish list for Fall! Estèe Lauder Pure Color Intense Eyeshadow Trio in Sterling Plums. These shadows certainly live up to their names for being pure color intense. These shadows range from soft shimmers to high metal shines and give beautifully pigmented color and blend effortlessly. These trios also boat long staying power, whether or not you are wearing eyeshadow base, which I adore. I hate when your eyeshadows move around during the day. A great must have for Fall! Sephora Collection Colorful 5 Eye Shadow Palette in Pale to Rich Taupe. For the savvy shopper, the Sephora Collection is a great way to change up your look without breaking your bank! These palettes provide a beautiful collection of colors. I especially like the Pale to Rich Taupe collection, which has some great shadows for Fall. The shimmery light to dark taupes work together seamlessly and are great for mixing and matching for every event. Too Faced Neutral Eye Shadow Collection. I have raved about this palette for months now and I still see myself using it through the next couple months. These shades provide a great neutral look that can be blended up for day or night. It even comes with an awesome glamour guide to provide step by step ways to create beautiful looks with both the shimmery and matte shades. Nars Duo Eyeshadow in Isolde. My last favorite for Fall is one the Nars Duo eyeshadows. I especially love the duo Isolde, which has both a frosted ginger and shimmering copper shade. I think it’s a great color change for the Fall season. It makes me think of changing leaves and Pumpkin Spice lattes. I really like that these duos can be applied both sheerly or built up for a dramatic effect. They also can double as eyeliners when applied wet! The color combination alone makes this a great duo for Fall! Know of any other great eyeshadows for Fall? Share them with me in the comments below!